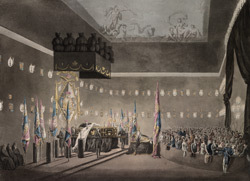 Nelson was given a splendid state funeral and burial in 1806. From 5 to 7 January, his body lay in state in the Painted Hall of the Royal Hospital in Greenwich. His body was then placed in Charles II's state barge and rowed up the Thames to Westminster for the funeral.